Biotech Ultra Loss Shake is s low-calorie protein supplement for women. It is a high-protein shake with a low content of carbohydrates and fats, which is a perfect meal substitute. It contains protein from various sources (BTN protein matrix: whey protein concentrate, whey protein isolate, casein, milk protein, amino acids). The product contains the complex of vitamins and minerals, bromelain, carnitine, inulin, chitosan and Garcinia Cambogia extract, which effectively supports the process of fat reduction and weight loss. Bromelain is a plant enzyme, obtained from the fruits of pineapple. Its main function is the breakdown of proteins, thanks to which it supports digestive processes. Undigested protein in the digestive system may result in intestinal ailments, the feeling of fullness and storing undigested food, which stimulates decay processes and the production of toxins. Moreover, by inhibiting the activity of pro-inflammatory prostaglandins, bromelain has analgesic and anti-inflammatory effect and it accelerates wound healing. It contributes to faster regeneration of damaged muscles and overstretched joints. Carnitine is a vitamin-like substance, naturally present in the organism. It optimizes the process of fat burning, as it enables the transport of long-chain fatty acids to the matrix of mitochondria, where they are broken down in the process of β-oxidation. The breakdown of fatty acids provides acetyl-coenzyme A (acetyl-CoA), which takes part in the subsequent biochemical transformations, conditioning energy production in the form of ATP. It results in better training efficiency and training parameters. Inulin is a natural polysaccharide. It constitutes a soluble fraction of dietary fiber and plays the functions of a prebiotic. Chemical structure of inulin makes it impossible to digest it in the digestive system of a human being, therefore it may move to the large intestine without any losses, where it constitutes a valuable foodstuff for beneficial bacteria inhabiting this organ - Bifidobacterium sp. and Lactobacillus sp. The development of the desired bacterial flora causes immunity boost, better digestion and absorption of nutrients and it positively influences the general state of health. Moreover, inulin decreases the concentration of cholesterol in blood. Chitosan is a derivative of chitin, which is a building material of crustacean shells. Chemical structure of chitosan resembles hyaluronic acid. Chitosan demonstrates unique properties binding fats, inhibiting their breakdown and absorption in the small intestine, which results in limited fat gain in the process of lipogenesis. Garcinia cambogia is a tropical plant. The presence of hydroxycitric acid in the fruits of the plant conditions numerous pro-health properties of Garcinia Cambogia. It is an effective product which supports weight loss. It was proven that the extract from Garcinia Cambogia stimulates metabolism, inhibits appetite, normalizes lipid profile (decreases the level of LDL cholesterol and triglycerides) and positively influences transformations of carbohydrates, decreasing the absorption of glucose. Clinical studies indicate the effectiveness of this plant in supporting weight loss. 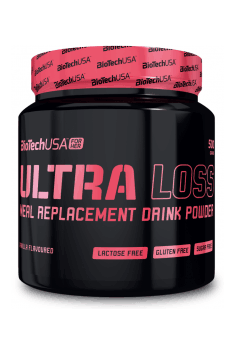 To sum up, Biotech Ultra Loss is a dietary supplement containing, apart from proteins, a range of other valuable substances, vitamins and minerals, which support the process of fat reduction and facilitating the growth of muscle mass. It is a product addressed to women who lead an active and irregular lifestyle, who are losing weight as a valuable meal substitute and in order to cover the organism's need for protein. Mix a portion of 20g with 300ml of skimmed milk or water. Drink 1-2 times a day. One shake after training and the second instead of supper. The protein shake is an easy and comfortable way to cover the need for protein in a diet. It is most beneficial to drink the shake after training. Dosage: the lack of standards unit consumption. Dosage as customary used in sports. Chitosan is a polysaccharide obtained from crustaceans carapace chitin. It is classed as a dietary fibre. Reduces the digestibility of fat. Like other fibres, it fills the stomach and fives a feeling of satiety. The supplement is used in the slimming diets. Available as mono-preparations and multicomponent supplements containing fat-soluble vitamins (such as A, D, K). Dosage: 500-1000 mg for approx. half an hour before the main meal, washed down with plenty of water.